SYNOPSIS: A con man, Irving Rosenfeld, along with his seductive British partner, Sydney Prosser, is forced to work for a wild FBI agent, Richie DiMaso. DiMaso pushes them into a world of Jersey powerbrokers and mafia. REVIEW: The Fighter director David O. Russell reunites with Christian Bale and Amy Adams for another period drama based on real circumstances. Written by Eric Singer (The International) and director Russell, Bale, Adams and Cooper try to grift their way to their biggest score. Irving (Christian Bale) lives a different type of life, growing up in a way that eventually led him to a life of grifting. Even with legitiment businesses from his father, he gravitates to taking advantage of those circling the bottom of the barrel where the desperate and despondent live. At a winter pool party Irving meets a kindred spirit in a woman named Sydney Prosser (Amy Adams) who incidentally elevates his con game. But even keeping the cons small enough to manage, Irving and Sydney get pinched by eager young FBI man Richie DiMaso (Bradley Cooper). Forcing the pair into helping him make a name for himself, Richie promises to let them go if he is handed four significant busts. When Richie gets a taste for success he demands bigger busts from Irving and Sydney. Feeling way over his head, Irving must figure out how to balance his and Sydney's tentative freedom, the good name of the Mayor of Camden Carmine Polito (Jeremy Renner) who he has grown to respect, the wants of DiMaso of the FBI and a bunch of mobsters and congressmen who want to invest in the Atlantic City boardwalk. 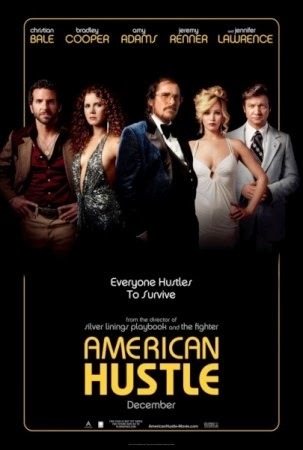 Set in the Spring of 1978 New York and New Jersey, American Hustle is a great throwback to the con artist movies of the past. Con games and artists are entertaining to watch. It is one of the reasons why White Collar works so well on the USA Network and why Paul Newman and Robert Redford's The Sting is such a classic. It's also why an audience will sit through a 138 minute movie. An audience will put into the time as long as there's a great payoff at the end. 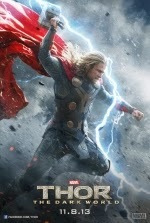 But it's not just the con game that keeps this film rolling. Filled with great dramatic and comedic dialogue delivered by great actors and actresses, as well as a paced plotline, American Hustle boogies down. Adams, Cooper, Bale and Lawrence create unique and nuanced characters filled up with their talent. Louis C.K. and Cooper do great work on a comedic side, making audience laugh at how ridiculous their work relationship is. Bale's Irving and Adams' Sydney are in constant jeopardy, pinning their well-being and livelihood on their grifting talents. The problem is that they have never worked on this large a scale. The style is 70s tones and disco abandon, letting the characters loose with necklines that extend to the waistline, wide lapels, hairy chest and gold medallions. The real world of 1978 was wrought with a recession, a war that left a bad taste in America's mouth and skyrocketing interest rates. While American Hustle is a story about scamming the system, it is also a backdrop for the state of the union. The FBI was still young and not even thinking about crime at the white collar level. Because of that and people's desperation grifting was very lucrative indeed. The cast is brilliant, the story is superb and well paced. 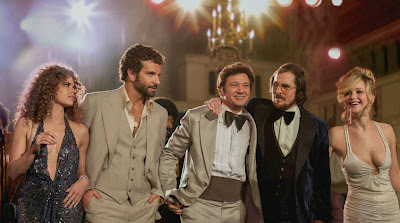 American Hustle is worth the money to watch, not unlike watching a street hustler move the hidden ball move under the three cups of the shell game. Labels: Alessandro Nivola, American Hustle movie review, Amy Adams, Bradley Cooper, Christian Bale, David O. Russell director, Irving Rosenfeld, Jennifer Lawrence, Jeremy Renner, Louis C.K.